Polaris aims to set a new benchmark for durability with its 850 Patriot engine. 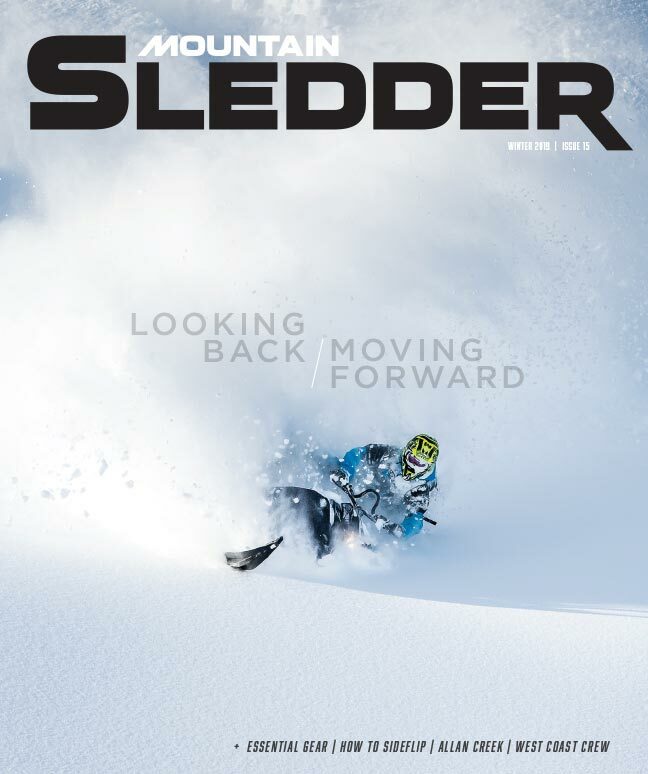 There’s no doubt about it, mountain sleds are subject to incredible abuse. They are constantly pushed to their utmost limits, in a frigid and hostile environment no less. Engines cycle from cold to hot and back again many times a day. In between, every last iota of power is summoned ruthlessly. These are high-performance machines tuned to the brink, and they are flogged without mercy. All that stress on an engine inevitably takes its toll in the form of squeaked pistons and seized cranks. 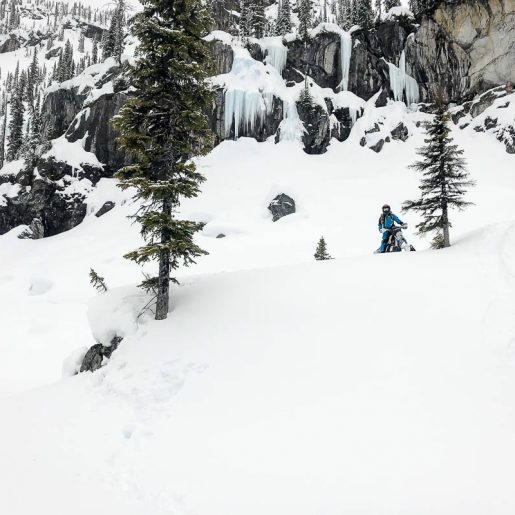 In mountain sledding it’s less a question of ‘if’ than ‘when’. Though we’re never happy about it, we have learned to accept that transforming perfectly good engine components into shrapnel is just part of the game. It’s the risk we take every time we go out, as our engine’s clock ticks inexorably closer to a violent and unavoidable death. Such is the cost of pursuing the freedom that mountain sledding offers. Yet there is hope. For model year 2019, Polaris aims to redefine our perception of durability with its brand-new 850 Patriot engine. 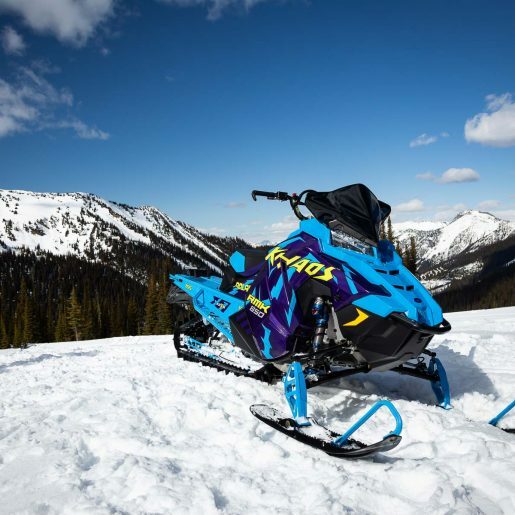 Outwardly, the 2019 Polaris PRO-RMK doesn’t look much different at a glance. But a closer inspection reveals a number of improvements with more significance than their visual subtlety might suggest. There are no flashy new body panels to wow us, but don’t let that fool you—considerable change is afoot. And it starts beneath the hood. 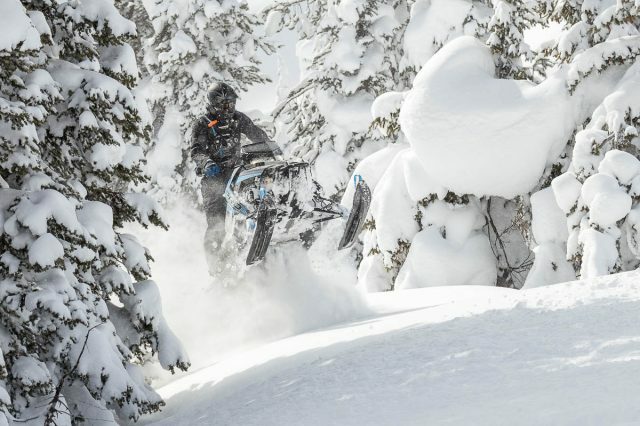 When news first broke that Polaris would release an 850 powerplant for model year 2019, internet trolls and buffoons at large immediately cried, “Copycat!” Sorry, but no; Polaris engineers say they have been testing versions of this engine on snow for five years now. For more substantiated evidence, one needs only look at the engine architecture to confirm that the Patriot is fundamentally different than that “other” 850. 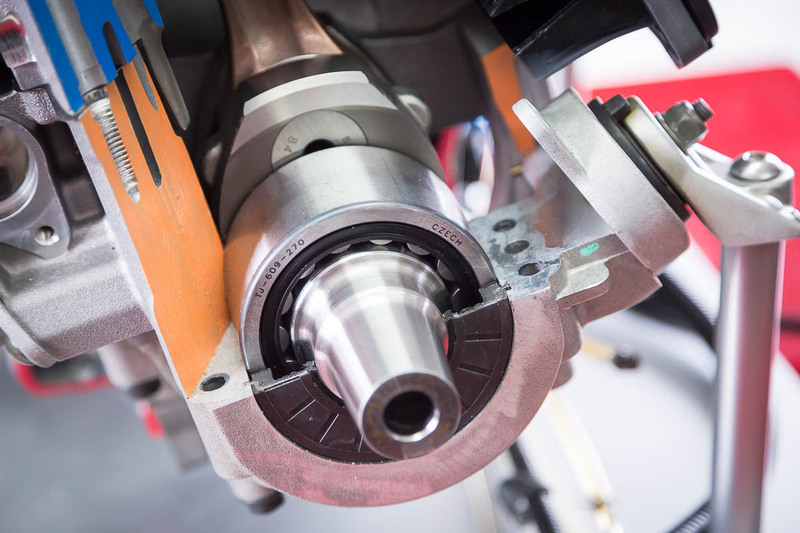 Key elements like fuel delivery, bore, stroke and even displacement (840 cc vs. 849 cc) vary. The only thing the Polaris 850 Patriot really shares with the competition is the slightly fluffed-up number in the name. Nor, however, is the 850 Patriot anything like the 800 Cleanfire engine that came before it. 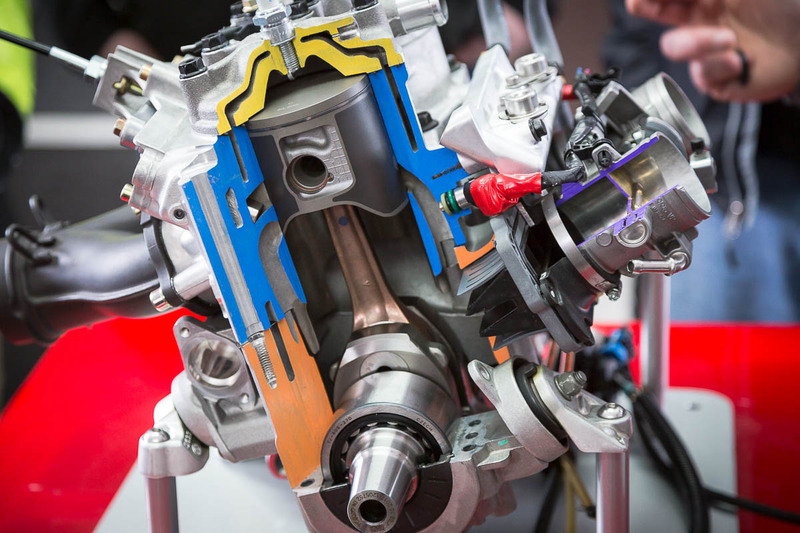 Rather it is a “clean-sheet” engine design that was engineered from the ground-up, making the most of 25 years of Liberty engine-building experience. The spark plugs, a couple of sensors and a handful of fasteners are the only components these two engines share. 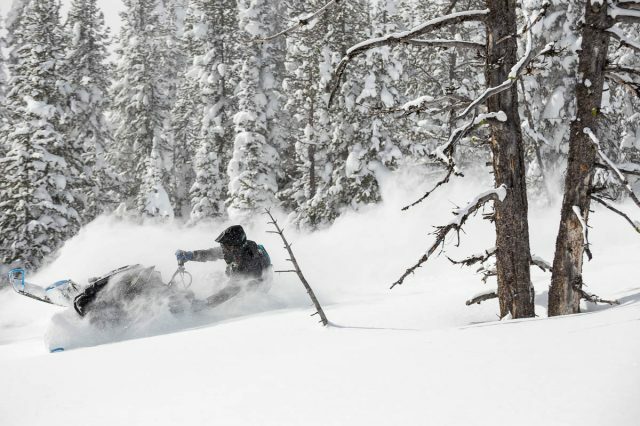 The idea was to build an engine that would change the collective expectation of what durability means with respect to a two-stroke snowmobile engine. Now, just let that soak in for a moment. That’s an ambitious goal. 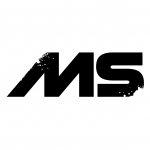 Instant responsiveness was the second key objective. This is the fun factor—the neck-snapping feeling of power, and how it is utilized for the technical riding of today. Polaris wanted the throttle response to be quick, linear and smooth. That makes for the feeling of plentiful—yet manageable—power. The Most Common Question—How Much Horsepower? It’s not incredibly surprising that Polaris declines to publish a horsepower specification for the 850 Patriot. It could be a sign of the knowledge and understanding the company has about the way the use of their products has evolved in recent years. Or perhaps the number just doesn’t compare favourably with the competition. 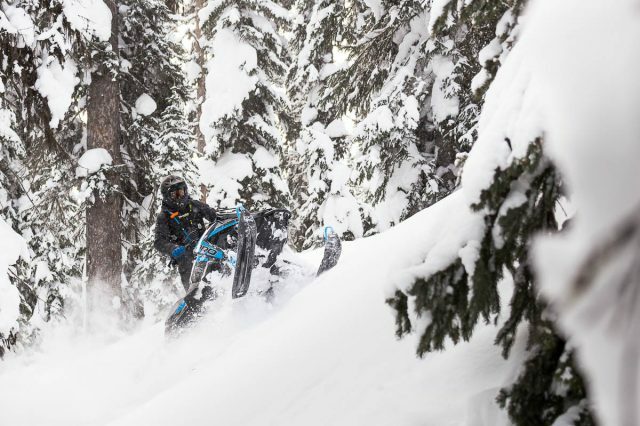 Most likely, Polaris is comfortable knowing that savvy riders these days care more about how a sled performs in the mountains than on a dynamometer. 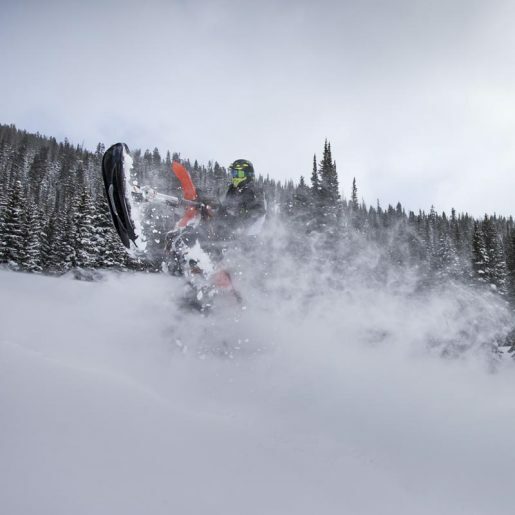 However, the manufacturer does go so far as to confirm that the 850 Patriot produces 9% more power than its predecessor, the 800 Cleanfire, making it the most powerful engine Polaris has even bolted into a production snowmobile. How Does It Perform on Snow? So, how does it compare in real-world performance? It’ll friggin’ rip your arms off, man. 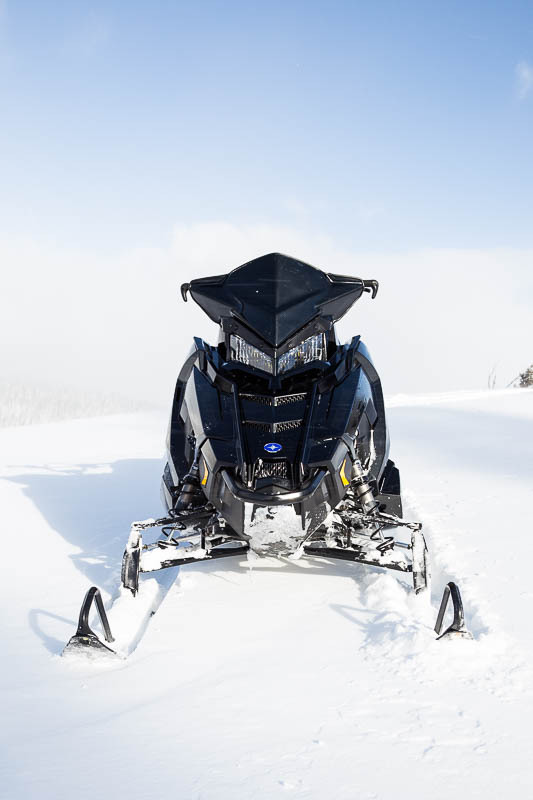 It takes about ten seconds of riding the 850 to attest that the engine truly is the most powerful Polaris has ever installed in a snowmobile. The Patriot 850 feels much more potent than the 800 Cleanfire, and the modest increase in output is the least of the reasons why. One of the most instantly noticeable characteristics of the 850 is how smooth it feels and sounds. By comparison, it makes the 800 feel utterly raw and unrefined. Whereas engine vibration could be felt keenly in the 800, the 850 is buttery smooth throughout the range of rpm from idle to rev limiter. But the responsiveness is the key performance characteristic that makes this engine so great. Consider how you ride. Are you running wide-open throttle all day? Probably not. More likely, you’re chopping the throttle on and off all day long. That’s where this engine shines. The 850 pulls hard and fast. 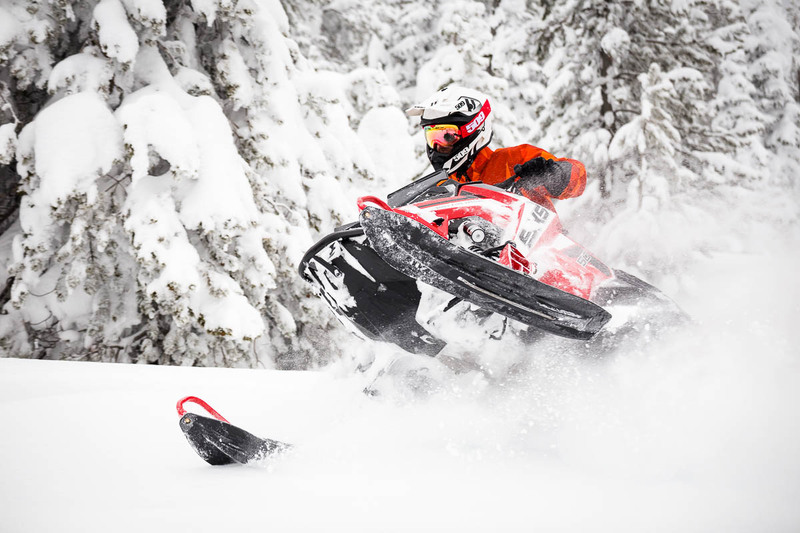 When you stab at the throttle, the sled leaps ahead. It’s a revelation. 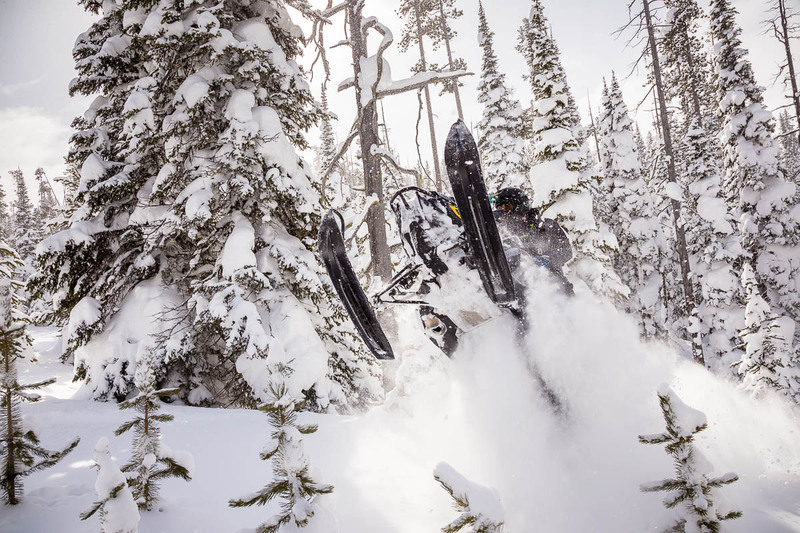 The 850 feels like it accelerates in real time with the throttle actuation—a characteristic which obviously shines more notably in firmer snow with good traction. 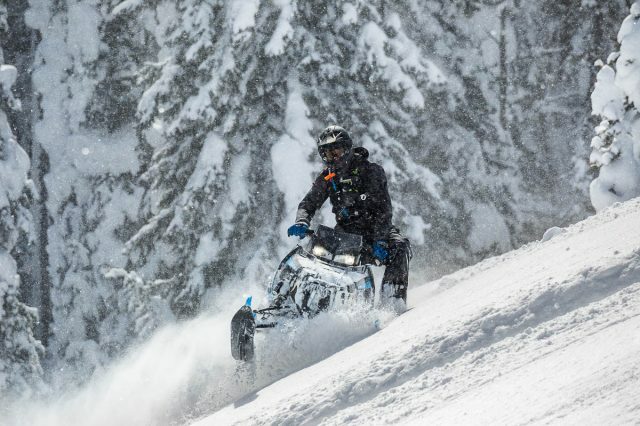 In keeping with Polaris’ commitment to building the lightest mountain sled on the market, the company has come up with some creative ways to cut additional weight and improve handling for model year 2019. 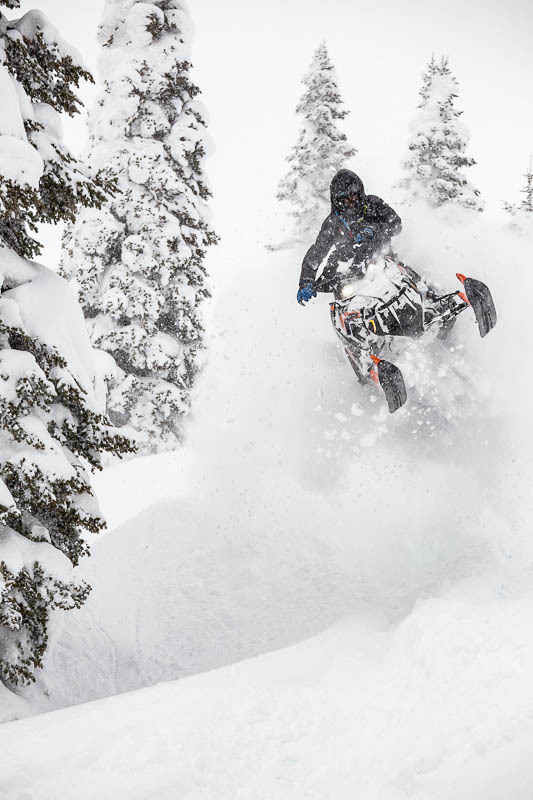 Polaris has finally narrowed the front-end down to an adjustable 36-38” ski stance. In addition to the upper and lower control arms, the spindle is now forged as well. The geometry has also been changed to provide more predictable sidehill initiation. The new React front suspension feels great, but takes a day to get used to. It still has the same PRO-RMK AXYS platform feel to it, but it’s now easier to initiate and hold a sidehill than before. It’s also a little easier to flop over too far, but that is a small matter of getting used to the feel of the narrower stance and dialing in the sweet spot. Polaris owners will feel right at home in a flash. 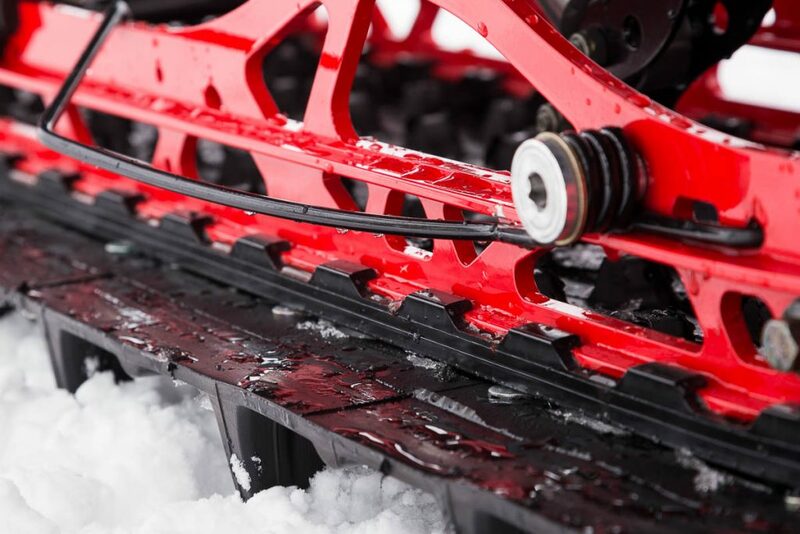 A new patented manufacturing process has allowed Polaris to utilize special steel springs that are actually lighter than titanium while still providing the same spring rate. These SLS springs use less steel—featuring only around 3 coils—thanks to the strength instilled by a proprietary heat-treatment process. 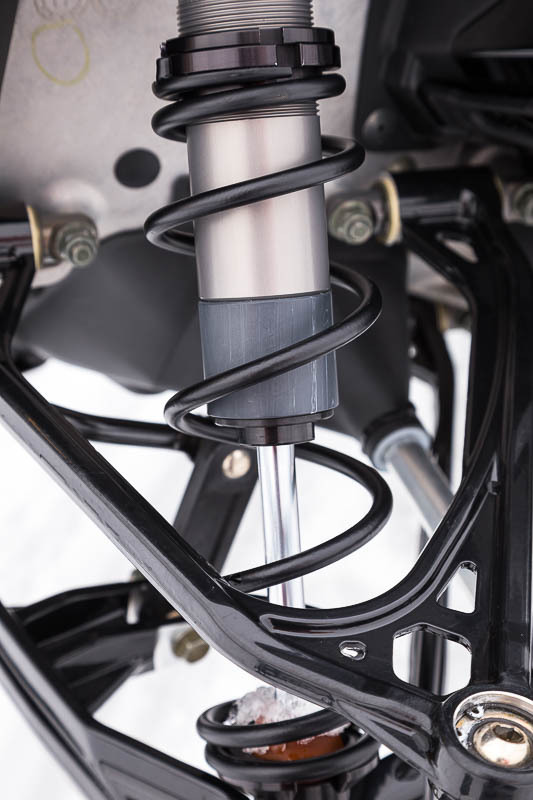 Accounting for the independent front suspension, center rear and rear shocks, the SLS springs offer a weight reduction of around 1.5 kg (3.3 lb) over the standard Walker-Evans shock springs. 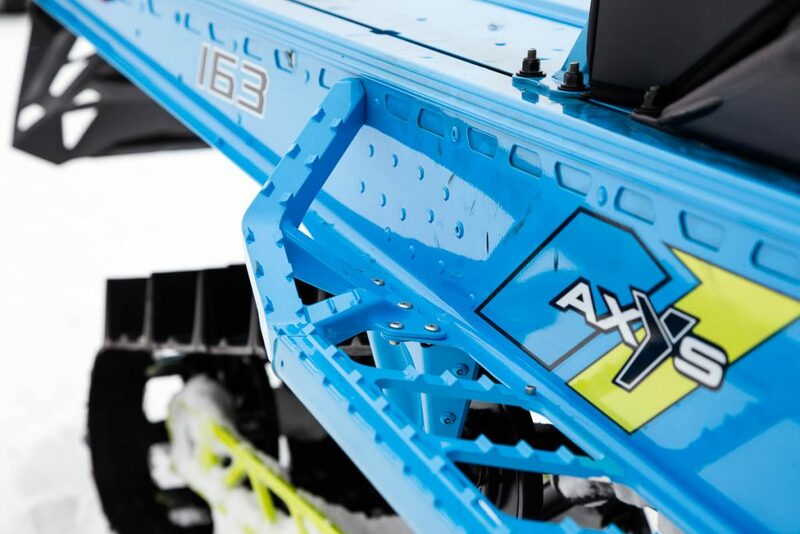 The new AXYS PowderTrax XT running boards have a similar extrusion, but the casting and attachment points are different. The running boards offer 7” of additional clearance in extreme sidehilling situations. This is achieved with a newly configured compound angle at the rear, while the running board itself is only slightly shorter overall. 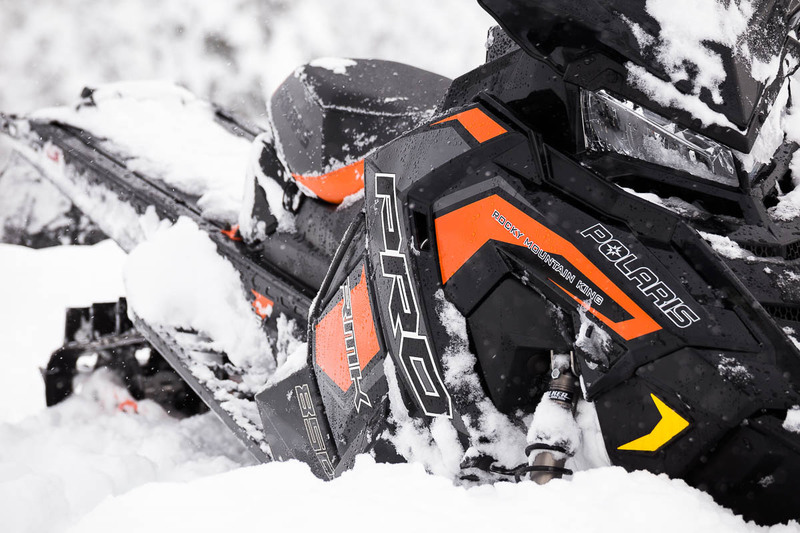 Polaris has also managed to eliminate more than 230 g (0.5 lb) of weight from the sliders of the PRO-RMK models. The new “XT Hyfax” have sections of the material that holds the slider to the beam eliminated. The wear material remains fully intact so that slider lifespan is not unduly affected. The fact is, we don’t yet know how well the 850 Patriot will hold up. 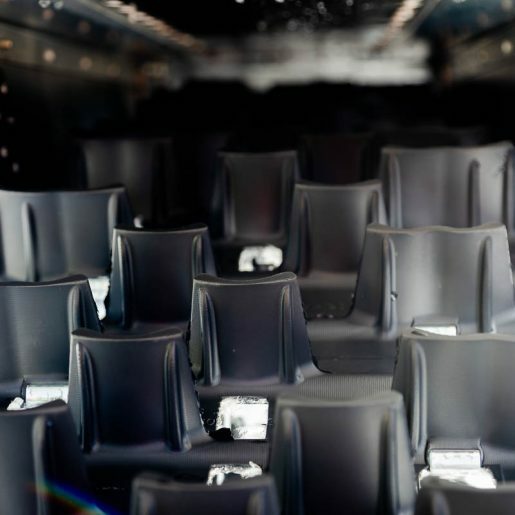 But given the priorities of the engineering team and their steadfast focus on durability, all signs indicate that these engines should have a lengthy lifespan. But this much we do know: Every Patriot 850 engine delivered this year comes with a 4-year standard warranty. And what better way than that for Polaris to communicate their confidence in the durability of this engine? Performance-wise, the 850 Patriot stacks up easily. It’s amazing what the manufacturer has done considering that overall power wasn’t even a top priority. It’s got heaps of jam from the bottom all the way to the top. And thanks to the focus on responsiveness, the power is linear, smooth and instantaneous. Now, if the durability of the engine can meet the goals of the engineering team, it may very well set a new benchmark in the industry. And we truly hope it does.